The Center is committed to educate the public in science and conservation issues and engage in active research and conservation programs. The Center is active in species survival and conservation efforts. 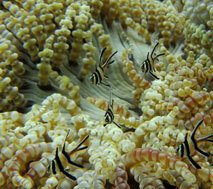 As the world’s foremost expert in Banggai cardinalfish, Dr. Vagelli has been researching them at the Aquarium since 1997. In addition to being the first biologist to fully document Banggai reproduction in captivity, he’s developed techniques for breeding this delicate species and has published numerous scientific papers on their biology and ecology. Most recently, in 2007 he appealed to the International Union for the Conservation of Nature (IUCN) to successfully secure an “endangered” Red List ranking for the Banggai cardinalfish. The Partners Protecting our Water is a collaborative of several local organizations working together to address water quality issues in the Camden City area. 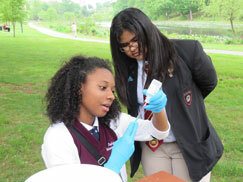 Led by the Center for Aquatic Sciences, the group includes Urban Promise Academy, the Delaware Riverkeeper Network and the Camden County Municipal Utilities Authority. The partnership has formed a strategic alliance that will begin with awareness, education and training activities and baseline water quality monitoring leading to community driven stewardship of the local Camden waterways and the encouragement and environmentally friendly practices in waste management. Coastal America, an interagency federal partnership that works to protect, preserve and restore the national coastal ecosystems, established the Learning Center network in 1996. By being a Coastal Ecosystem Learning Center, the Center has access to the scientific resources of 16 federal agencies that offer items such as ship time, technical expertise, exhibits, and educational materials, as well as chances to collaborate on research projects. This arrangement also provides the government agencies access to millions of visitors each year. The Center focuses on educating their visitors about the nature and value of coastal resources, and they join an international network of marine educational institutions that are addressing our growing coastal problems by creating a better informed public. FrogWatch USA is AZA’s flagship citizen science program that invites individuals and families to learn about the wetlands in their communities and help conserve amphibians by reporting the calls of local frogs and toads. Volunteers are trained in identifying local frog species, then choose a convenient wetland to monitor several times over the spring and summer. Each monitoring session lasts only 5 minutes, during which time volunteers record which species they hear as well as local weather conditions at the time. The data is then uploaded using an easy-to-use website. Independently, and in conjunction with the Ocean Conservancy’s International Coastal Clean Up Day, the Center participates in numerous river cleanup efforts throughout the year. Partnering with Adventure Aquarium’s Fins for the Future team, the Center staff have participated in a variety of conservation and clean-up activities. In 2014, the Fins for the Future team removed over 5,600 pieces of trash and recyclables weighing over 1,300 lbs. The 3 most common items removed were over 1,600 snack bags/wrappers, 1,400 plastic bottle caps and 1,300 plastic bottles.